Below are performance assessments from a Spanish FLES program that meets three times a week. The video is from 3rd grade and 5th, the audio file is from 5th grade. Performance assessments are critical to the health of a language program. They provide evidence of a range of proficiencies that teachers and students can build on in subsequent language classes. They also show students what they know and are able to do. When documented electronically, performance assessments can serve as tools for advocacy with administrators and parents. In the Weather Channel video, third graders are challenged to create their own "weather channel" and report the day's weather conditions. Language control and vocabulary use My grammar is correct when using memorized sentences. My vocabulary is varied. I am mostly correct when using memorized sentences.My vocabulary shows basic information. I am correct at the word or phrase level. My vocabulary is repetitive or limited. In the following audio clip, fifth graders are challenged to sustain an interpersonal exchange of their interests for a minimum of three minutes. They must respond to their partners interests as well as stating their own. Students were to sustain an unscripted conversation in Spanish. They randomly chose a partner by picking a hidden name out of a basket. The conversation had to be at least three minutes long and without pauses. In order to do their best, students had to be able to respond well to questions and show interest in what their partner was saying. 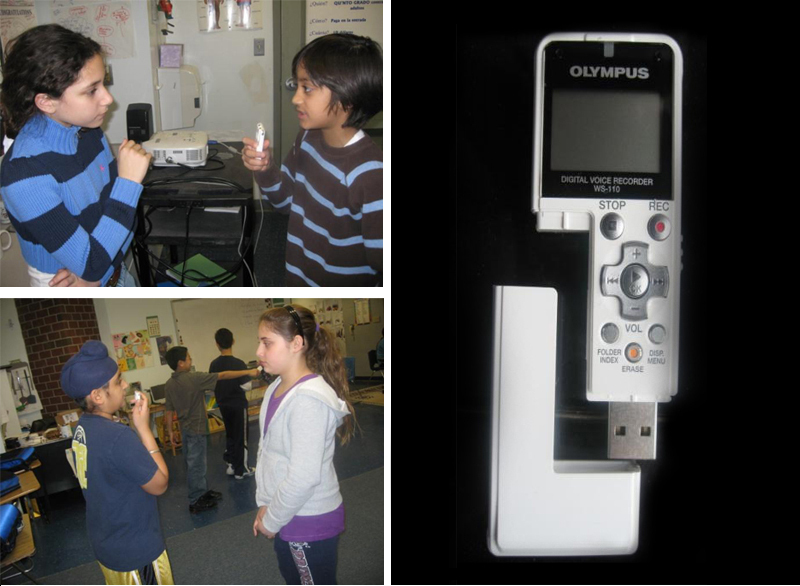 Having enough recorders for the class allows the pairs to record simultaneously so that students don't have to wait their turn or be tethered to a computer for recording. They can move around the room or record in the hall. It can be instantly played back over speakers in class. The files can be easily downloaded onto a computer for sharing, mailing and scoring. Here, a fifth grade students talks about himself and another person. It's an individual presentational task.